Make monitoring portion sizes quick and easy with this Taylor TE10FT 11 lb. digital scale! Keep customer satisfaction high in your foodservice industry by practicing good portion control, which adds to the consistency of a product. The Taylor TE10FT electric portion control scale features an easy-to-read, large 7/8" LCD readout. An auto off function helps conserve power, yet it can be disabled by the user if not needed. 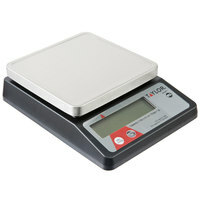 The scales' convenient tare feature allows you to easily weigh products and ingredients while still in the container. This Taylor digital scale has a removable, stainless steel 5 3/8" x 5 3/8" platform, and has moisture resistant sealed components, making cleaning, sanitizing, and maintenance even easier. The Taylor digital scale operates on an included AC adapter, or 2 AAA batteries (sold separately). We use this on our pizza line to weigh sausage and chicken. Great little scale that is holding up very well. My pizza makers love it compared to as larger more expensive scale we used to use. Recommend greatly, especially for the price. This is a great scale that runs on either two AA batteries or the supplied AC adapter. One button changes between grams and ounces, while the other controls the power and tare. Seems very accurate so far. Metal platform is removable for easy cleaning. Great for baking and portion control. The small size of this scale makes it perfect to use and store away freeing up valuable work space. Removable stainless steel plate let's you clean and sanitize easily. We have had ours for over four years and it is still going strong. I had bought a scale through another company and it kept messing up. Someone suggested I try this one and when I looked it up Webstaurant had the best deal. I am glad I bought it because it is a good scale and very accurate. our prep LOES this new scale. the tray is removable, for easy use and safe food prep. have since bought another set, as the line kept taking the preps. love these! We purchased this scale about 2 years ago and it still works perfectly, we haven't even changed the batteries. The scale registers quickly, provides consistent measurement and has a big easy to read display. The tare feature lets you subtract the weight of any container you are using, and its quickly switched between ounces and grams. Great deal. I absolutely love this scale! It works great! I have never had an issue with this scale! I bought mine back in 2015! Very pleased with this product. Works great for a compact digital scale. We use it everyday for baking. My only complaint is that after a year one scale started to weigh inaccurately, but I guess you can't complain too much for the price. Overall it's a pretty affordable unit. I like this scale due to its compact size and being NFS approved. My two frustrations are 1) how sensitive it is to little liquids which cause it not to work until it dries out and 2) the power cords internal wires break quickly for being for commercial use. We were having issues with our hand patties not coming out the same, this little scale works great for insuring a consistent product. in one day it has cut our food cost by 2%. Easy to use, easy to read, easy to clean, and easy to store. This is a great light duty scale for portioning. We use this scale for pasta, portioned meats, etc. The basic functions work as they should and the price was more than reasonable. This scale is great we bought two at the same time. The first one died immediately and it is honestly just too complicated to get it replaced. The second one has lasted like a champ. The batteries last for a good amount of time too, but have etc. on hand so batteries don't take you down mid-shift. Excellent product, very accurate scale and works in multiple units. Very portable and works both in batteries and ac power. Great for small kitchens that lack space. Although well constructed, have to be carefully handled to prevent falls to the ground. A very common problem in restaurants, that can only be solved by using cheap and light chinese scales. Accurate scale, NSF approved, and can read in multiple units. Works great at our coffee shop. My only wish is that it had an option to red back floz a well. Handles my biggest Kitchenaid mixing bowl full of flour, but stashes easily in a drawer. I love that it has a built-in cover for the adapter. Unit is protected when plugged in, but also when running on batteries, with the little attached outlet cover. Very easy to switch from grams to ounces. I can finally bake the recipes in my European (gram based) cookbooks! Very easy to use and zero out for good portion control. We keep this next to our line at all times to make sure salads and fries are the correct weight. We have been using this scale for almost a year now, every day, all day long. No problems so far with inaccuracy. Easy to clean. Worth the money even if we have to replace it every year. This scale is a must have in a commercial kitchen for accurate portioning. It's easy to use, read, and makes the prep go by a lot faster. I've used taylor scales in the past and they generally last a long time, if you put them in a safe place where they will not be dropped. Works well enough. Periodically inconsistent by 1-2 grams...I might weigh something, take it off, and weigh it again to find a weight change of 1 or 2 grams. Plug in charger is a bonus! I used the product as soon as it arrived even though I didn't have AAA batteries. Wish the scale weighed to the first decimal point, but love that it's NSF certified. Good product for the price. Would buy again. It's an OK buy, but you will have to replace it after a year. As buyers we prefer to spend more and have a product last longer, but in this case the scale itself started to give the wrong weight after a year of use. This scale is perfect for a bakery kitchen. Flour has nowhere to hide because the buttons are covered and the scale surface comes right off for easy cleaning! This was a bit of a disappointment. The scale converts from grams to kilograms when weighing larger quantities. It confuses the staff. I would return it if it wasn't for shipping and a restock fee. This is the best scales that I have used both at home and in the industry. They are very sturdy and the battery lasts a considerable amount of time depending on how often and how much you are scaling out ingredients. This is a great space saver for our kitchen. We use it to weigh out meats for sale by the pound (for larger orders, catering, etc). While the scale seems accurate up to larger amounts, the platform isn't really big enough to put a large container on. I wish this came with a different platform just to make it easier to put a larger sized bowl or container on. For the money, this is a good product. I love this Taylor digital scale. We have one of these and on of the manual dial ones and I like the digital better because you just have to hit a button to tare off your container. Also easy to clean and runs on AC or battery. This scale was great while it worked. It's for use in a kitchen -- when one of our team members spilled water by it -- it shorted out. We have not been able to get it to work since. Quite unfortunate. Thank you for your review! We are sorry to hear that the scale you purchased broke after getting water spilled on it. We recommend Taylor’s waterproof scale to take care of the problem. This scale is good for the price. The only thing I don't really like about it is it doesn't weigh in tenths of a pound. Instead it weighs, for example, 3 lb 9 oz instead of 3.75 lb. In that we primarily use decimal place when weighing by the pound, it's a bit convenient. We made a conversion chart to take care of the concern. Terrific scale for the price. We have 1 or 2 in each of our schools, as portion sizes are an integral part of regulations. Great because they are both battery operated, or plugged in. They can move anywhere in the kitchen. Great scale and the price can't be beat. This is to replace a mechanical scale that the staff had problems reading. Now the kitchen staff has no excuse for not portioning food correctly. Easy to use and stores in a small area. Thanks again Webstaurant. This scale is very easy to use and clean. The metal top comes off for separate cleaning. The display is easy to read. If you need measurements to the hundredth then this scale does not suit your needs, but it works well for us! I been looking for a scale for my kitchen, that is has a good price and is accurate. while this scale is cheap, I ABSOLUTELY will not recommended to anyone, very inaccurate. i would weight something to 800 g, take it off the scale put it back on and then it said 1011 g, this happened multiple times. please save your money! Thank you for your review! We're sorry to hear your scale is inaccurate. A Customer Solutions Representative will remain in contact until the issue is resolved. Best price you will find these accurate little scales. These scales are great for portioning high-cost items. We use them daily and they go up to 10 lbs! This taylor compact digital scale weighs very accurately and has worked well even after being dropped on several occasions and I would definitely buy again. This is a handy small scale that can easily be converted to oz/ grams and lbs. I like that it has a plug as well. I bought this scale to replace one that was on the fritz. Very compact so it can be put away fairly easily. My only complaint is that sometimes it can be a little slow to update measurement. But its usually only a second. The metal plate is also removeable to clean which is very convenient. I purchased this item couple years ago , and it is still in a great working condition, it helped us a lot with the portion control. I bought this Scale to weigh out all my pasta dishes so i could be consistant. The scale does exactly what it is supposed to do and is very simple to use! this is a handy little scale to have around. it's a little smaller than I expected, but it's effective, starts quickly, and measures accurately. We use it in our deli, but would also be good in a bakery. This is an item that is used every day. We use it to weigh out our potato and pasta salad. Scale holds up very well. What a great addition to every kitchen. It allows you to set a tare weight so you don't have to subtract the weight of the container holding the ingredients. And I love that it weighs 10 pounds. Most small scales I've found only weight up to 5 pounds. This scale is so-so if you tend to measure in gram wt. It does NOT measure tenths of grams. The sleep mode turns off the unit after a short period of inactivity whether using battery or DC power. That is a killer when you've only partially added your ingredients and need to step away and return later to resume. The Taylor TE 10c 10lb. Compact digital Scale. it is great for measuring out the same preportions every time.You can not beat the price, and you'll love it. This scale works perfect for measuring out all our hamburger patties and pre-portioned food in the morning. Lasted 6 months before needing a new battery. This is a great scale. This exact scale is probably in many kitchens nation wide. It is excellent for portioning out fresh fish filets and getting them spot on. This is a wonderful scale. Its simple and to the point. Its easy to clean light weight and fits into larger knife kits. this scale matches the quality of most scales in its price range. This is a great scale. The scale is very accurate. I have only needed to calibrate it once in 6 years of use. It is a great deal for the price. This product is a great value. We went through 2 Salters and another Taylor purchased in the local grocery or dept store and not one of the three lasted a month. This TE10C is being used in my commercial kitchen by my employees. It is designed for this environment, with the removable cleanable plate, easy to use 'clean wipe buttons' and an adequate capacity (10 Lb) greater than that which you could typically load something this small with. It is small enough that it sits on our prep station all the time. This is a very small scale. I would not recommend this for a commercial kitchen. This would be great for a residential kitchen where it needs to be stored away. We have used several of these. Batteries last a long time, and they take a beating pretty well. Will probably order more in the future too. This is a very good scale. It gived fast and accurate readings everytime, and it's easy to clean. We did have a machanical scale before, the taylor TS5 and that one was a waste of money. Great scale for measuring items up to 10 pounds. We use this regularly in our restaurant for inventory control. It is easy to clean also. This is a great digital scale. I use this one for my bigger items, like burger portions and steak cuts. It works flawlessly, and without any burps. I love it. This scale is good because it has a high weight capacity. Only problem is that when on battery power, it will turn off after only a few seconds. So be sure to keep an eye on the weight if you walk away to grab another ingredient. This is a fantastic kitchen scale! I have used many different brand names of scales for portioning out fish and meats but the Taylor TE10C is lightweight and accurate! Easy to clean if you get it dirty! Great price for a digital scale! Portion control will easily pay for this item in no time!!! This is a good scale for weighing baked goods. It measures both lighter and heavier baked goods. Indispensible if you are selling items by weight. Can plug in or run on battery, so is very portable. The scale has an auto-off feature to save battery power; however, there is an easy way to turn off the feature. Because I use it primarily to measure chocolate, I have to zero it out with whatever bowl I'm using to measure in. It does seem to eat battery power relatively quickly. Other than a tendency to turn off after a few seconds between weighings, this scale is terrific. I especially appreciate that the stainless steel plate is removable for easy cleaning. Functions perfectly. These scales are great... we use them infrequently, so the price is right. I use them for everything from portion control planning to weighing bulk items received to ensure they're full cases. this scale is great! easy to read, small enough to store, easy to wipe down, and easy to calibrate - runs on 9V batteries which you can buy through webstaurant for a great price! This scale was great. It did exaclty what it was supposed to and we use it regularly to weigh items at our store. The scale is very accurate. I needed a digital scale for the kitchen so I decided to go with the Taylor TE10C digital scale. I really like it's small size because I can easily store it in my crammed drawer and the option of using either an AC adapter or the batteries for the "wireless" operation. The removable stainless steel surface is also a handy function since it makes it easy to rinse it without exposing the whole digital scale to the water. Another excellent feature is the ounce and gram mode: because different recipes call for different measuring units. I recommend this Taylor scale to any kitchen. This scale was exactly what we were looking for. It is easy to operate yet small enough. We measure all our salad ingredients as we make our salads every day. We used this scale for accutately measuring baking products and meats for sanwiches. Just having it has reduced our waste and improved the quality of our baked goods. This is the second scale we've had like this. The first one lasted 8+ years, so here's hoping that this one lasts just as long! So far this item has been a great addition to my collection. It is easy to use and comes with a removable tray that makes cleaning easy. The A/C adapter is really nice to have as well. It is fairly compact and is able to fit in a fairly small footprint. The display is really easy to read as well. The 10lb. capacity is a really nice feature as well. So far I haven't come close to this limit.